Crews battling blazes around California have experienced no water shortages during the prolonged siege, the state fire agency says. For the last two days, President Donald Trump has been tweeting that California's raging wildfires have been made worse by environmental policies that — according to him — have left the state with too little water to fight the blazes. But the experts who have actually been involved in the crisis say there is no foundation to that claim. Instead, they said the fire crews have had plenty of water to fight 17 fires, which, the experts noted, have been made more likely and more intense during the prolonged fire seasons that have come with climate change. In staking out his position against California's environmental and water policies, Trump is embracing the long-standing contention of some of the state's farmers that too much water is allowed to flow into San Francisco Bay to support salmon, other fish and endangered species. "California wildfires are being magnified & made so much worse by the bad environmental laws which aren't allowing massive amount of readily available water to be properly utilized," Trump tweeted Sunday, following up with a second tweet Monday that pinned the purported shortfall on Gov. Jerry Brown, a Democrat who leaves office at the end of the year. A spokesman for the state fire agency said crews battling blazes around California had experienced no water shortages during the prolonged siege. "We have plenty of water," said Scott McLean, a spokesman for the California Department of Forestry and Fire Protection. "The Carr Fire is around three reservoirs. The Mendocino fires are by Clear Lake and other reservoirs. We are not having any issues with a lack of retardant or water." Asked what might have motivated Trump's comments, McLean said, "I have no idea." That opinion was seconded by Glen MacDonald, a professor of geography at UCLA and an expert on wildfires. "It's just not the case with any of these these fires that we don't have the water," said MacDonald. "It's a kind of basic misunderstanding of what wildfire is in the state of California, what caused them and the resources used to fight the fire." MacDonald said that the more salient trend in California in the last several decades had been temperature increases that have come with global warming. "That has lengthened the fire season," MacDonald said. "That means that fuels dry out more quickly during the season ... and when the temperatures are very high it means the fires burn more intensely." MacDonald noted that 14 of the 20 worst fire seasons in California's recorded history had occurred since 2000. 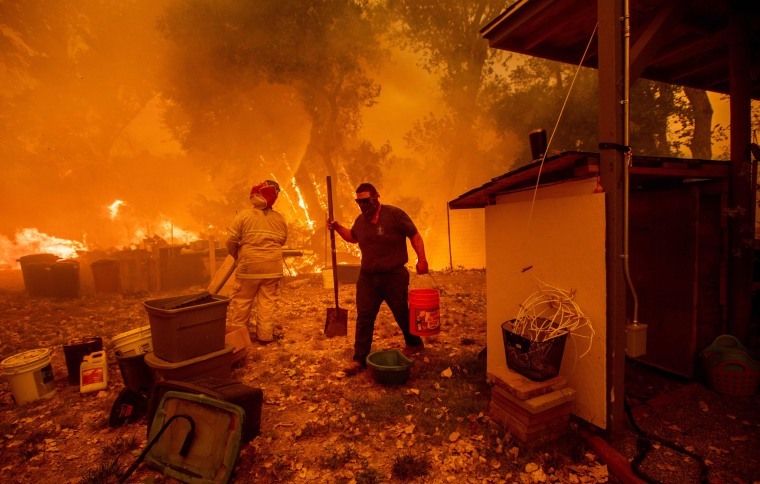 And the deadly Carr Fire, which hit the city of Redding near the north end of the state, was exacerbated by 100-degree-plus temperatures. In his second tweet on the subject, Trump said on Monday: "Governor Jerry Brown must allow the Free Flow of the vast amounts of water coming from the North and foolishly being diverted into the Pacific Ocean. Can be used for fires, farming and everything else. Think of California with plenty of Water — Nice! Fast Federal govt. Approvals." Brown's spokesman, Evan Westrup, said: "This does not merit a response." Complaints about use of the state's limited water supply have raged for decades. Anyone who has driven through California's vast Central Valley has seen billboards blaming the government for allowing too much water to remain in the Sacramento and San Joaquin rivers, which both spill into San Francisco Bay. But other farmers and fishermen dispute that position and support greater flows into the Bay. "This is really a political fight about California environmental regulations, in general," MacDonald said, "which are irksome to some people in the White House and in the Republican Congress." McLean, the Cal Fire official, said he had lost track of how many calls he has received since Trump's tweets about the issue. "I have other things to do," he said, "like deal with the fires."